Some friends of mine at our little book club asked me to teach them knitting, and I was honored to do so. I have never taught anyone to knit before, really, but lately I've noticed that I've been knitting long enough myself that I really understand how the stitches work, and what happens when you make them. It's pretty cool. Another ten years, and I might be ready to design a pattern! Ha! I talked with my friend, the marvelous Mary, at my local knitting shop, and asked for tips. I thought I'd share them with you, in case you want to teach knitting, too! Cast on for your student(s), and have them practice the knit stitch, before teaching them to cast on. Brilliant tip, actually. The knitted cast on is just like knitting, but it's a little tricky when you're first learning. Once they are comfortable with the knit stitch, it's much easier for them to learn the cast on. Start with cheap yarn. Red Heart Super Saver is a good option. You can make several small things with one skein, and it's not a huge investment. You don't want to buy expensive yarn before you know if you will enjoy knitting. 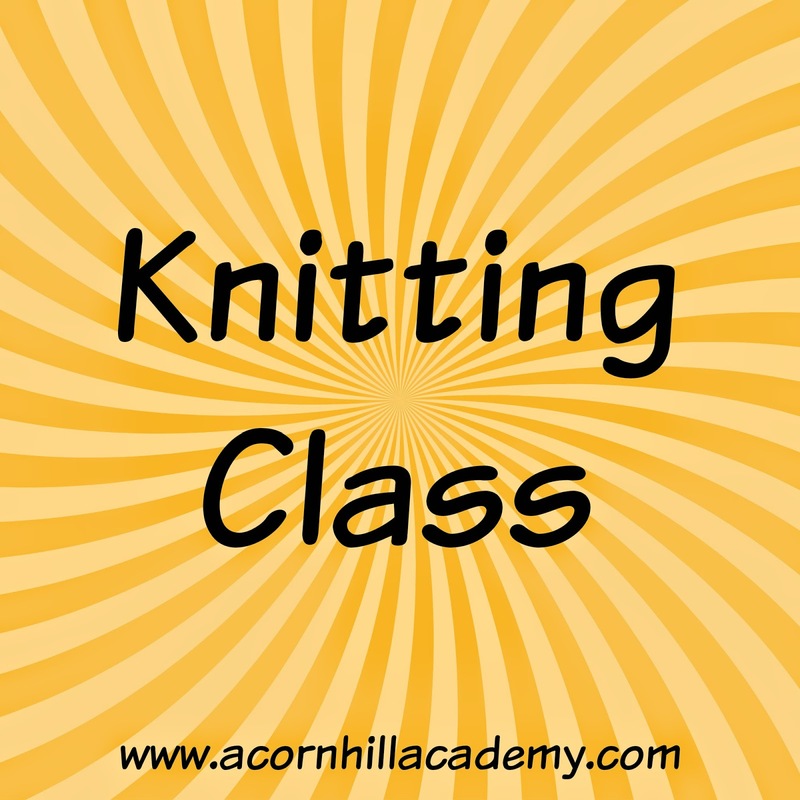 I start by teaching my students to knit a dish cloth. I make them with cotton yarn, usually Lily Sugar and Cream, because it's (a) fairly inexpensive and (b)goes on sale often and (c) is readily available at craft stores, and even Wal-Mart. However, Marvelous Mary told me that one can make a dish cloth using Red Heart, and it turns out more like a scrubbie. Red Heart comes in all kinds of garish bright colors, so you should be able to find something for just about everyone. Limit the number of students. Knitting is almost a one-on-one thing. It's hard to teach more than one brand-new student at a time, because you never know exactly what they will have trouble with and how you'll need to tweak the lesson. It's good to be able to sit with someone and watch what they're doing, so you can catch any errors before they become habits. 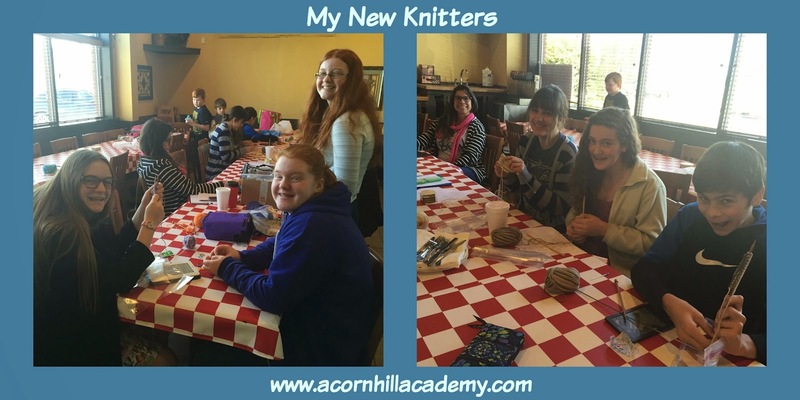 I was fortunate to have one of my daughters who knows how to knit there with me, so she could help some of the other students. Also, two of the girls knew how to knit already (one just needed a little refresher) so that helped a lot. One thing I hadn't thought about ahead of time was the possibility of left-handed knitters. I had no fewer than three. You wouldn't think it would be such a big deal for either them to watch facing me, or for me to simply knit left-handed, but that was a real mind-bender for me. Even the poem came out incorrectly as I tried to teach them. I had Jack coming in through the window and out through the front door instead of the other way around. I am going to practice left-handed purling before our next session so I can teach it better. I encouraged my students to practice every day, just for 10 or 15 minutes. 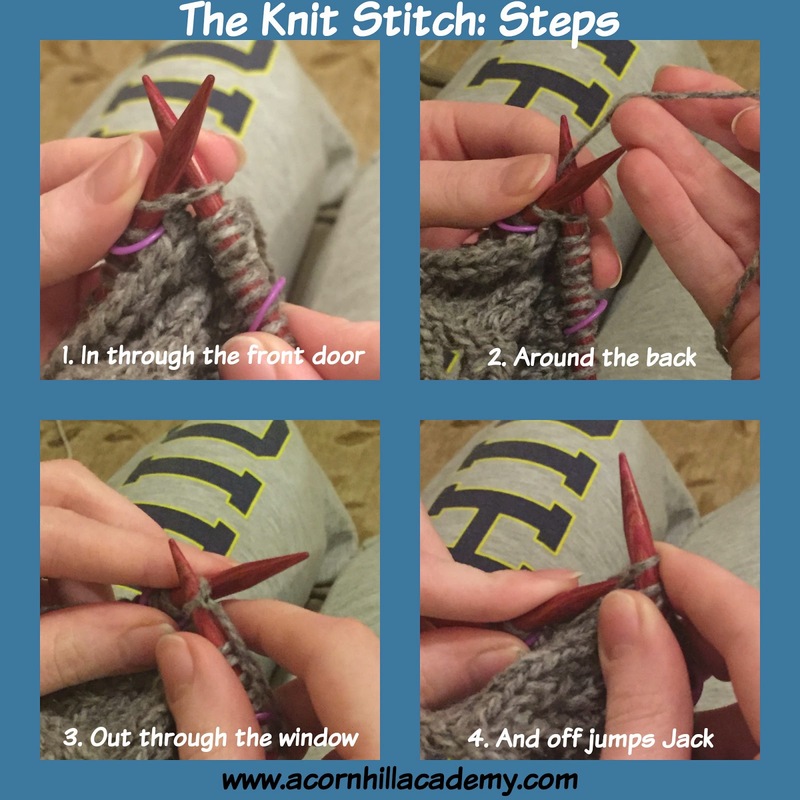 That's the best way to become comfortable with the stitch (just like anything else). 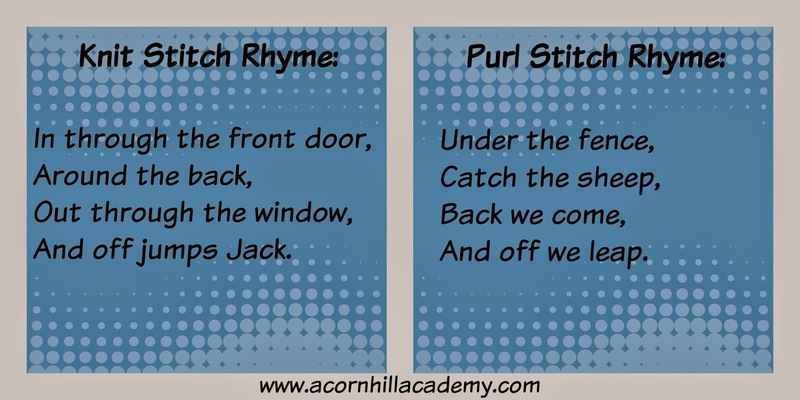 When we get back together this month, they will learn the purl stitch. If we lived closer together, we would meet more often, and we might still try to do that, but our first meeting was at our monthly book club gathering and we didn't make plans for another time outside that. Meeting weekly would be ideal, but I live about 45 minutes from where our book club meets, so we'd definitely have to plan a get-together; it's not as simple as just meeting up locally. The two students who were already comfortable with knitting started making small dish cloths. They used this pattern, which is a very common one and a great beginner's project. In addition to knitting practice, it teaches yarn overs and decreases. Those two were so funny! They knit like gangbusters so they could get the first half done, so I could show them how to decrease for the second half before they had to go on to their other class. I haven't quite decided what we're going to do next. Knit Picks has their 52 weeks of free dish cloth patterns (something for both knitters and crocheters), and I think it might be just the ticket for our little group. Dish cloths are small, manageable projects, and they would have the opportunity to learn several different patterns that way. I've had a request to learn to make a headband, too, so that's a possibility. I'll keep you posted on our progress. I'd love to sit in your class. I learned to crochet but not knit. Looks like fun! Kim, I'd love to have you! :-) After knitting for about 10 years I've finally figured out how to crochet. We could trade lessons!